The latest crop of LED facades works like an HUD for the planet. 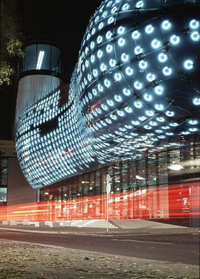 I’m gonna go out on a limb and say it started in Austria: In 2003, the 930 fluorescent rings covering Kunsthaus Graz’s blobby facade flickered to life and ushered in a new era of architecture-as-video-screen. As far as architectural symbologists were concerned, this was like the Second Coming. The appearance of all these screens is not some harbinger of cultural decline. It doesn’t signal the end of architecture or even, necessarily, a cheapening of it. What it does mean is that more and more we find ourselves estranged from the physical, bricks-and-mortar life of buildings–and that we look at the cityscape not just with divided but with fully fractured attention. LED buildings can do more than just look pretty. He mentions augmented-reality-equipped facades (been there, done that). But what about buildings that change with the weather? Jason Krugman’s “Firefly” is an LED screen that attaches to a building and flashes as the wind blows through it, like a visual wind chime. 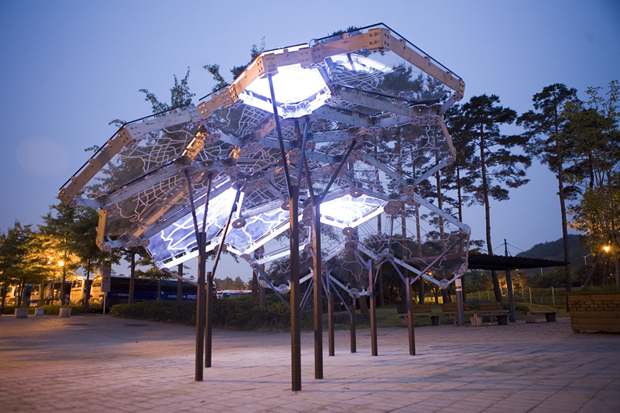 Then there’s the Living Light pavilion in Seoul (top) that displays air quality on an interactive map of neighborhoods around the city. Designed by New York firm The Living, it’s a great example of a building that doesn’t just shout at us, but tells us something we want to know.